You want beans? Well we got some seriously spicy Boston-Style Baked Beans here! The slightly smokey flavor from the bacon married with the smoky paprika in Zio’s Smoky rub are perfect. The hint of sweetness and a good level of heat can’t help but make you want more. Tempter the intensity of the heat by adjusting the amount of spice and you’re good to go. Most recipes call for ketchup, and that’s all fine and dandy, but our’s kicks it up a notch by using our own Zio’s Homemade Ketchup. Trust us on this one. * you can also use pinto, white kidney or small red beans. 2. On the stove: In a large dutch oven, fry the cut bacon in 1 tbsp of olive oil until browned sufficiently. 4 add the green and red peppers, cook until they soften, in about 5 minutes. 5. 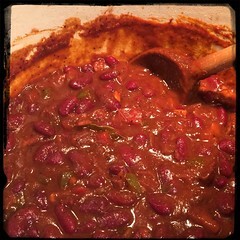 Add the baked beans, mix carefully without ‘breaking’ any beans. 8. Let come to a simmer, cover and remove from stove. Place in pre-heated oven and let bake for about 45 minutes.